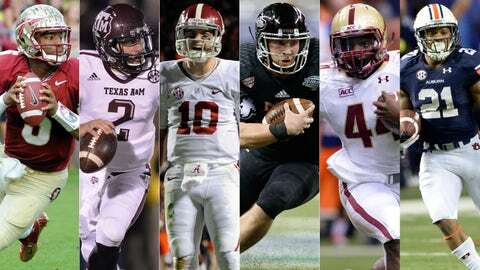 From the left: Jameis Winston, Johnny Manziel, Jordan Lynch, AJ McCarron, Tre Mason and Andre Williams comprise the largest group of Heisman Trophy finalists since 1994. The drama has already been sucked out of this Heisman Trophy race, with little doubt that it will be Jameis Winston’s name who will be called Saturday night. The Washington Generals face better odds on a nightly basis than the other five finalists do of upsetting the Florida State quarterback. While Winston may challenge Troy Smith’s 2006 records for the most points by a winner (2,540) and the highest percentage of available points (91.6), there does remain some intrigue surrounding the ceremony — namely who will finish second? This race has been harder to get a clear grip on — outside of who will win it — than any in recent years. In fact, this voter was considering seven players for his ballot heading into the final weekend before the deadline and one of the player who made the cut wasn’t even among those initial seven. (NOTE: This is not reflective of my personal selections. Due to Heisman Trust policy, voters are not allowed to publicly release their ballots until after the trophy has been handed out). A Winston win will be a perfect one not only for what he’s meant to the Seminoles’ run to the BCS title game, but because it would go in line with voting tendencies both recent and in the past. Winston is set to follow Johnny Manziel as the second straight redshirt freshman winner, fitting as the first QB, Davey O’Brien (1938), gave way to another a year later in Nile Kinnick. After Tim Tebow’s breakthrough for sophomores in ’07, two more came in as many years with Sam Bradford (2008) and Mark Ingram (2009). The Seminole will also continue the run of dual-threat QBs, making it four straight after Cam Newton (2010), Robert Griffin III (2011) and Manziel. Of course, with three years of eligibility ahead of him, Winston will soon deal with a whole new set of perceptions and expectations, but we’ll hold that discussion until after he joins college football royalty. 2. Tre Mason, RB Auburn, Jr. The numbers he carries to New York — 1,621 yards and 22 TDs — are in the ballpark of the 1,736 yards and 19.5 TDs that the other RBs who have finished in the top three during the Age of the Dual-Threat QB averaged. But it was the state of the race itself that helped Mason the most. With a logjam of candidates that were hard to rally around, Mason made the most of playing on the last weekend of the regular season, torching Missouri for an SEC title-game record 304 yards on 46 carries, and subsequently helping to give the Tigers the right to play for a BCS crown. We’ve seen candidates make big late pushes late to reach the ceremony, including Montee Ball (fourth) and Tyrann Mathieu (fifth) in ’11, and Ndamukong Suh (fourth) in ’09. By comparison, Mason’s case is extraordinary. He simply wasn’t on the radar before the closing hours of voting and we’re looking at a likely top-two finish. His spot in the spot in the voting, which should be the best for an RB since Mark Ingram and Toby Gerhart were 1-2 in 2009, completely defies the logic of a Heisman candidacy. But we may just want to consider it the power of the SEC on display. If name recognition is currency in Heisman voting, McCarron is Scrooge McDuck. As we’ve discussed before, the Heisman and its voting aren’t about career achievements. He lost the backbone of his narrative after the Crimson Tide was knocked out of the national championship hunt, but those two BCS titles, 36-3 record as a starter weigh heavy in McCarron’s favor. It doesn’t hurt that he’s a household name thanks to his play and his girlfriend. It’s helped him overcome overcome statistics (2,676 yards, 26 TDs and five interceptions) that are the lowest for a non-dual-threat QB finalist in seven years. He should produce a finish which would be in line with how voters have treated similar veteran QBs in their last seasons — see Colt McCoy in ’09 and Brady Quinn in ’06, both of whom were third. 4. Jordan Lynch, QB Northern Illinois, RS Sr.
Lynch is the wild card. He could go as high as second and he could finish in sixth, depending on whether ballots were cast before championship weekend (some voters don’t count that as part of the regular season) and how much a BSC bowl berth (which he missed out on) mattered to the voting public. Standing on the cusp of becoming the first 2,000-yard passer/2,000-yard rusher in history — he’s 119 rushing yards away — Lynch already holds the FBS single game (321) and season (1,881) records for rush yards by a QB. That resume ought to result in the top finish for a non-BCS player since Boise State’s Kellen Moore was fourth in ’10. It’s hard to see him climbing much higher than that though, considering a schedule that, sans a BCS berth, sits 121st per Jeff Sagarin’s computer ratings and includes no wins over Top 25 teams. But if any player could finish higher than this prediction it’s Lynch, who produced the kind of numbers that transcend the conference he plays in. 5. Andre Williams, RB Boston College, Sr. He didn’t end the season as the nation’s hottest back — see Mason, Tre — or its most consistent — that would be Arizona’s Ka’Deem Carey, who has an FBS-best string of 16 games with at least 100 yards. But the magical number Williams hit in becoming the ninth player in history with at least 2,100 yards certainly registered with voters. Williams should do well in the North East region, which outside of its ACC ties to Winston, doesn’t have a natural candidate. Though it likely hurt his national appeal that he ended with a thud in a 29-yard day vs. Syracuse that lasted just over two quarters due to injury. If he does hold down this spot, Williams would have the worst finish for a 2,000-yard rusher from a BCS conference since Cal’s J.J. Arrington was eighth in 2004, and he’d tie Troy Williams (1995) for the lowest position by one of those rushers who had a seat in New York. 6. Johnny Manziel, QB Texas A&M, RS Soph. It’s worth noting here that the number of finalists is not an arbitrary number decided upon by the Heisman Trust; it’s decided by the most natural break in the voting figures. That we have the highest number of players since 1994 — Rashaan Salaam hoisted the trophy that year, while Ki-Jana Carter, Steve McNair, Kerry Collins, Jay Barker and Warren Sapp looked on — could speak to just how tight the voting figures will be. But here’s my take on why Manziel is included: he’s Johnny Manziel. Having the reigning winner on hand regardless of what the numbers say is good for TV. In 2009 Tebow was invited despite finishing in fifth, 425 points away from fourth. While Manziel was third in the nation in total offense (368.2 per), he ended the season with the two worst games of his Aggies career and his team stumbled to a 4-4 mark in the SEC. None of this is to say he doesn’t deserve to be in NYC, but just don’t be surprised if he beats Tebow for the dubious record of the worst finish for any defending winner who made the ceremony.